Mangaluru, Oct 26,2016:Reports have come in that Hoteliers in Surathkal on Oct 25, Tuesday questioned the MCC, Mangaluru City Corporation’s imposing of fine or serving notice on them for letting waste water to open drains without providing proper underground sewer network facility to them. 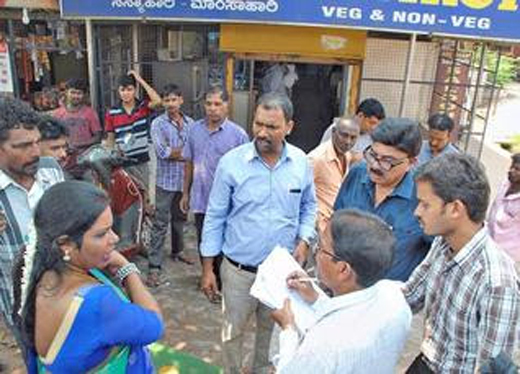 When Kavita Sanil, chairperson, Standing Committee for Public Health, Education and Social Justice, went on an inspection of shops and other establishments she checked Hotel Sadananda, City Lunch Home and Hotel New Aadarsh. The hotel authorities said that they had been forced to let out water to open drains as the city corporation itself had asked them not to connect their waste water lines to the underground sewage network laid in Surathkal sometime ago. The network was a failure because of poor planning and execution. It was the responsibility of the corporation to provide civic facilities for people including the hoteliers, they said. They said that they did not have any other option but to let out waste water as all of it could not be transported by suckers. Corporator Sanil said, “The matter related to sewage network is looked after by another department.” She said that letting waste water into an open area might lead to an outbreak of dengue and malaria in the area and she was concerned about that. The hoteliers should build their own sceptic tanks and the tanks should be emptied regularly, Sanil added. Hope these aids are genuine and not work with the bribe ? We appreciate her move. Action has to be taken. Well Done Mrs Sanil .You have taken stringent measures against the restaurant with lack of a proper hygiene and sewage too. Action Has to be taken on the business undertaking s. Because along with providing delicious food you have to also think of the hygiene to the customers .